Wow!! What a turn out to the work party. We guesstimate that close to 35 people came out Aug 19 and hacked back the shoulders and worked the road. It was hot work, but with so many folks grinding away we were able to open up the sight lines from the highway down to the launch. The road itself received seven loads of gravel which was worked in by Rob Parent and Mike Stephenson who volunteered their time and personal tractors to the task. Thank you to all who came and helped out. This is a big reason this lake is a such great place. When you use Thatcher next time remember who keeps this up and don’t take it for granted. The horseshoe tournament is back! Over 50 people attended at The Glen on Sep 2 on a warm sunny afternoon. There were 24 teams to contend for the trophy and bragging rights. With 8 of the teams on the go at one time, there were plenty of spectators and cheering gallery. Under the direction of Nikki LaSpina, with assistance of Glen Foster, everything went smoothly and the 4 horseshoe pits were kept busy. Everyone had a good time. Thanks to all who helped get The Glen ready and the pit crew who manicured the sand between the draws. The Glen is a public park, with a playground structure and the horseshoe pits, at the end of Lakeview Trail, which is off Peterson Road. 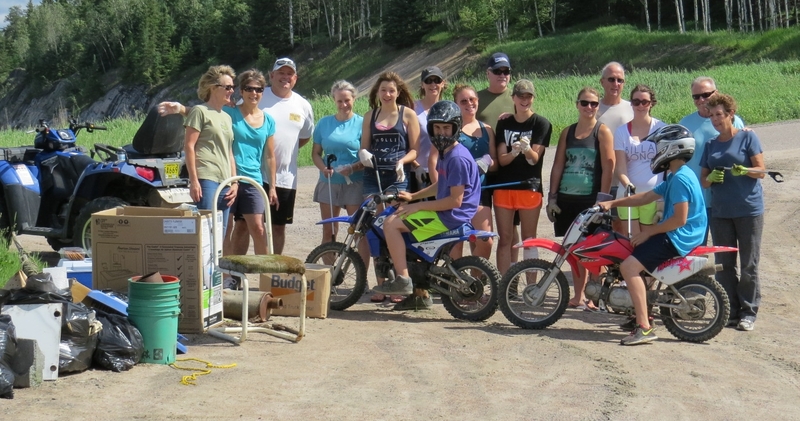 The horseshoes are in a bin next to the outhouse – so come anytime and get practiced for next year. 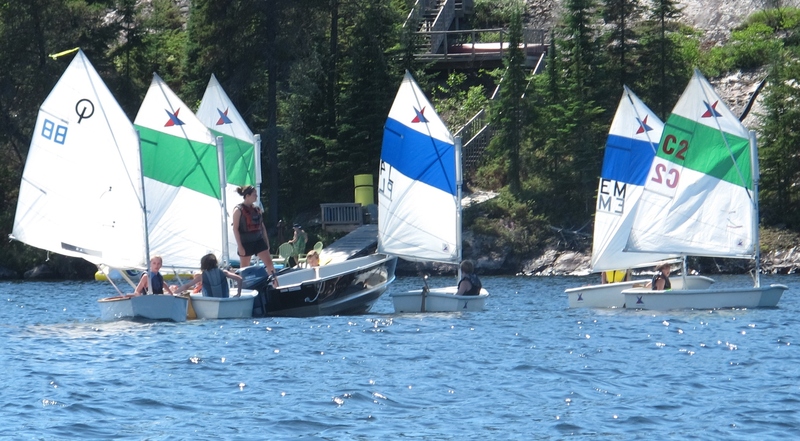 The fifth annual Black Sturgeon Lake Sailing School was successfully concluded this past July with two full classes of adults and kids participating with lots of excitement and fun. The weather was favourable both days, although there was a brief delay on Sun pm for a high wind squall to pass. The BBQ at the Melnyk’s was well attended. Thanks to all the folks who volunteered loading and unloading the boats at Snow’s and for lending boats for use in the school. We look forward to next year. 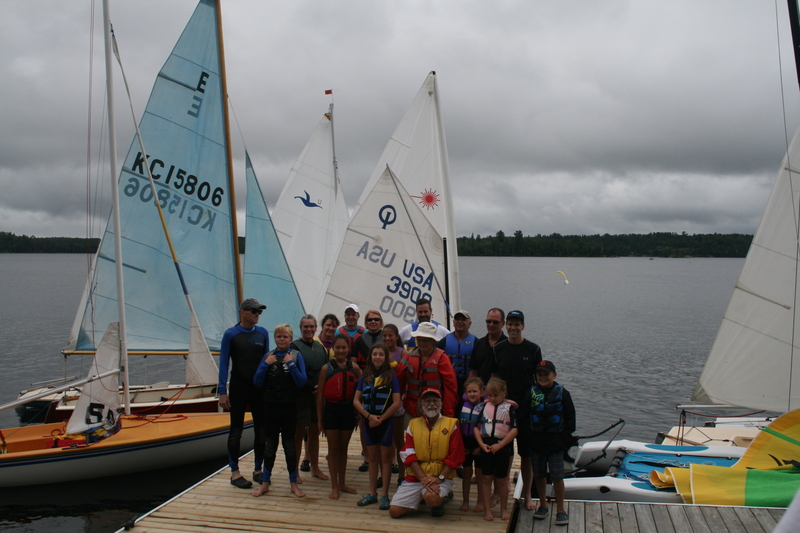 The third annual Black Sturgeon Lake Sailing School was held this past July with two full classes of adults and kids participating. There were 14 kids (ages 7-15) and 16 adults who sailed over the weekend of the 19th/20th. As in previous years the winds were light on the first day but this being an abnormal year the wind picked up on Sunday and those who got on the water in their boats were treated to the wrath of the South Wind. All in all it was a lot of fun and you can expect to see the school back again next July. Thanks to all the folks who volunteered loading and unloading the boats and thanks to my neighbours the Brauns and Browns for lending their docks to the cause and to Ted and Linda Evans for letting us use their little boat as a coach boat for the weekend. Also, a special thanks to Karl Snow of Black Sturgeon Camps for letting us load and unload at his place again this year. Sun Jul 6. A dog on Sunset Trail was killed by the wolves this morning. Also, one wolf was seen on Mineault Road. Everyone with dogs and those that are walking on the roads be aware and take precautions. Fri July 4, Cathy Wiseman and Leanne saw 2 wolves coming out of the gravel pit heading off into the bush by Reidigers . They watched them go into the bush and come out in the Moncrief clearing where two more were lying in the tall grass and joined them. They did not appear to be threatened at all. That makes 4 wolves for sure, so wanted all the walkers especially those with dogs to be alert. Too close for comfort. 2014 Peterson Road Clean up. Many thanks to the volunteers (see picture) who came out Sunday June 29, 2014 to help with the cleanup along Peterson Rd. Despite the growth along the roadsides and in the ditches, it was amazing how much junk/garbage was picked up. We had a team of helpers in the sandpit who did a great job of picking up all the broken glass from bygone parties. It took only a hour and it was time well spent! As a further note, we are planning on doing this once again, but most likely it will be held May long weekend before the green starts to grow (and mosquitos make their presence known)! The AGM was held Jun 21 at the Minis Hall, Super 8 Motel in Kenora. About 50 members attended. Mayor Canfield was the guest speaker and the Mayor did a good job covering the taxation issues and many of the behind the scenes issues. The press also attended and the discussion was covered in the paper. See the newspaper article. great success and well attended. The threatening rain held off making for a wonderful evening of renewing lake friendships. Thank you to Frank and Michelle Hinks for hosting. On with the summer! 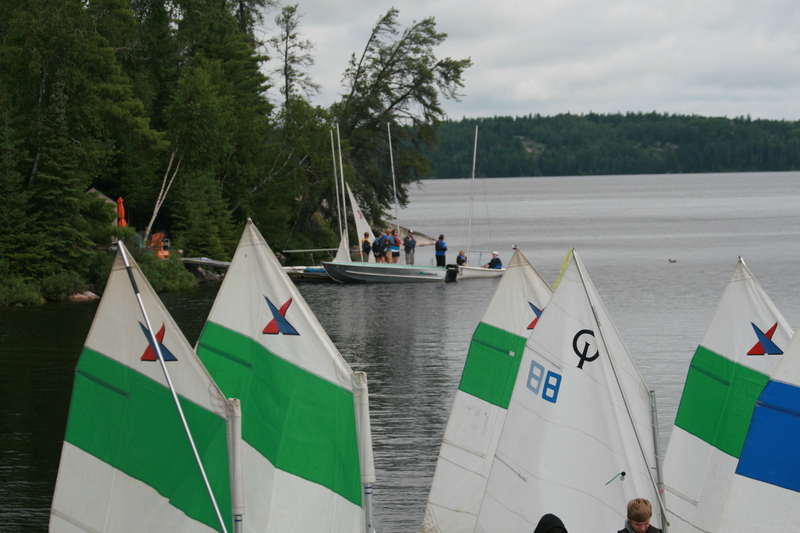 Jul 13/14 The sailing school, organized by Phil Burns, was full and had great weather. Light winds for the first day, brisk winds for Sun morning causing a few dumps bur perfect fresh breezes on Sun afternoon. The BBQ at the Melnyk’s was attended by lots of both adults and kids. 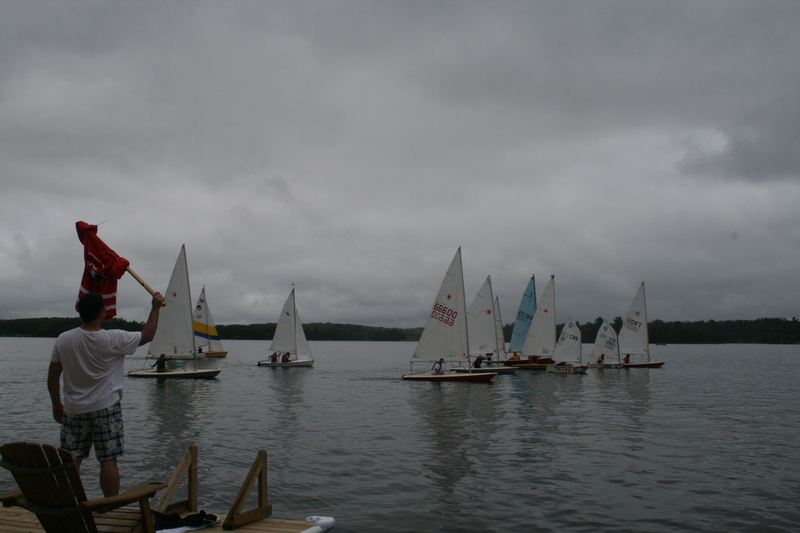 Keep next year in mind if you missed it this year and look for more sailboats on the lake. Here is a picture of the kids on the water on Sunday.